It seems like our 2016 wedding season is just getting started but it’s neverÂ too early to start looking ahead to next year’s weddings as well. 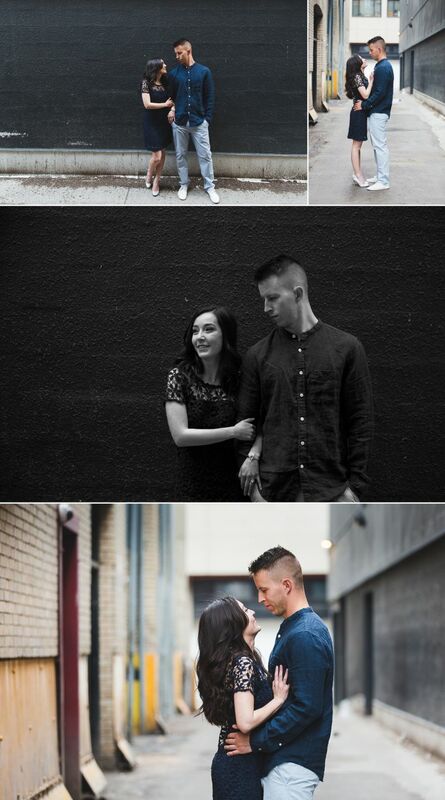 Mariah and Shaun are getting married next springÂ in Edmonton and they wanted to meet up with us in the summer to get their engagement photos done. Shaun loves to ride his motorbike and they both really wanted to incorporate his bike into an urban-inspired session. We decided to meet up downtown behind the Art Gallery of Alberta for a few photographs with his bike before an outfit change and more photos in and around downtown Edmonton. We had a great time getting to know Mariah and Shaun a bit better and we managed to finish up their session before the storm clouds started to roll in so Shaun could get home safe and dry! Enjoy this sneak peek from their session and we can’t wait to share their wedding photographs with you next spring!